With Iowa and New Hampshire dominating political news and Florida’s presidential preference primary not scheduled until March 15, it is easy to lose sight of the Sunshine State’s relevance as one of the nation’s premier swing states—a place where a battle is necessary to tip the final vote tally in one direction or another—and much more representative of the nation’s population makeup. A grueling slug-fest it will be beginning with registering new voters—and keeping older ones from changing their registration from a major party to a minor one or no party at all (NPA). Source: U.S. Bureau of the Census, 2015 Census Estimates. Florida’s two major parties willspend a great deal of time (and money) over the next 10 months trying to expand their traditional bases. 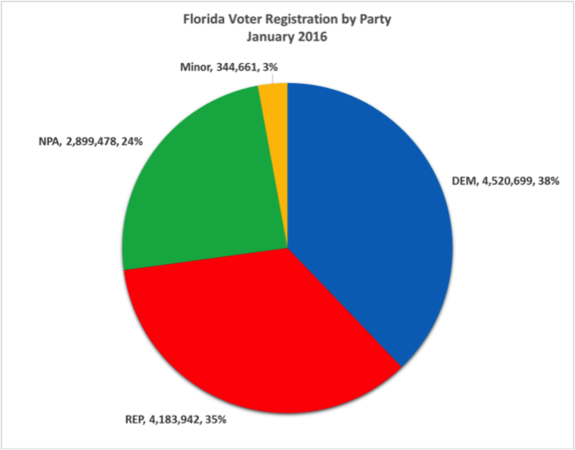 What better way to start tracking this election year’s grassroots operations than to take a close look at the composition of Florida’s registered voters at the beginning of 2016. A glance at the detailed graphics that follow will yield some helpful insights into the registration battle that will surely dominate each party’s Get-Out-The-Vote (GOTV) activities over the next 10 months. Data are from the public access Florida Voter Registration File provided by the Division of Elections and include active and inactive voters—each of which is eligible to vote. Here are the key findings, each keyed to the relevant Figure located at the end of the column. v Party affiliation: Both Democrats and Republican registrants are shrinking as a share of all registered voters; “other” (NPAs and minority party members) are on the rise (Figure 2). 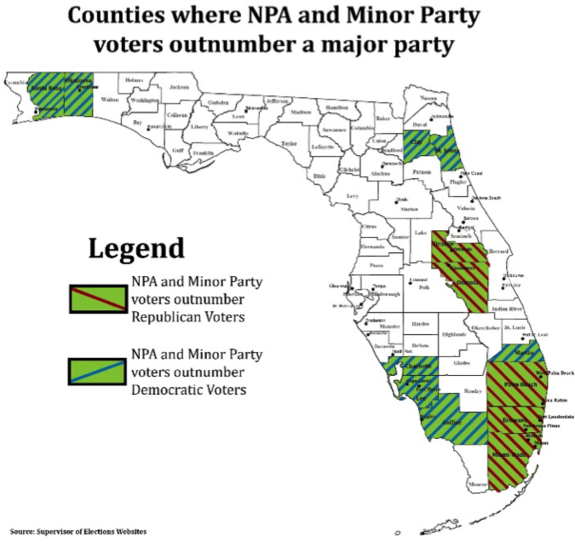 NPA and Minor Party registrants now represent more than one-in-four of Florida’s registered voters—a pattern observed in the U.S. overall. v The Democratic edge over Republicans has actually shrunk since 2012. January 2016: Dem 38%, Rep 35%, NPAs 24%, and minor parties 3%—Figure 3. In early 2012, the figures were Dems 40%, Reps 36%, NPAs 20%, and minor parties 4%. v Two-thirds of all registrants are white, followed by Hispanics (15%), blacks (13%), Asians (2%), and other (4%). (Figure 9). The Hispanic and Asian shares have increased since early 2012—white (68%), Hispanic (13%), black (13%), Asian (1%), and Other (5%). Other includes unknowns, American Indians/Alaskan natives, and multi-racials. In general, one-in-three of Florida’s registered voters is not white. Both blacks and Hispanics are under-registered compared to their share of the adult population, perhaps for different reasons related to the ineligibles among them (age, incarceration, citizenship status). v In the two I-4 Corridor markets (Tampa + Orlando) hold: 48% of white registrants, 47% of Asians, 42% of other minority registrants, 34% of Hispanics, and 33% of blacks. v 56% of Florida’s registrants are 50+ while 44% are under 50. (Figure 14) This pattern will be the focus of both parties. Because in early 2012, the age differential was smaller: 48% under 50 and 52% 50 and older. v Using generational age definitions, the two youngest generations (Millennials and Gen-Xers), make up 48% of the registrants, while those from older generations (Baby Boomers—34%, the Silent—16%, and Greatest—2% Generations) make up 52%. (Figure 15). BOTH PARTIES WILL FOCUS ON REGISTERING YOUNGER MILLENNIALS ON COLLEGE CAMPUSES WHICH WILL ALSO INCREASE RACIAL/ETHNIC DIVERSITY IN THEIR PARTIES. v Women make up a majority of the registrants in every age group—but a higher percentage of those 65 and over(54%) than the youngest cohort (50%). (Figure 20) An even sharper difference can be seen by generation. Women from the Greatest Generation are 63% of the registrants compared to 51% among Millennials. (Figure 21) Longer life expectancies among older women than men account for these differentials. v The state’s largest media market in terms of registered voters is the Tampa-St. Petersburg-Sarasota market(24%). 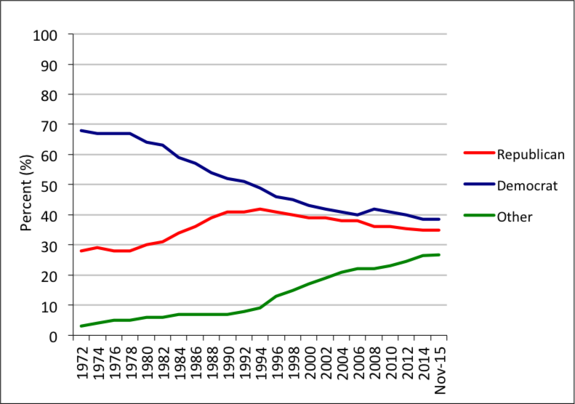 (Figure 26) The percentage of registrants by media market has changed very little since early 2012. A challenge facing both major parties in 2016 leading up to the November election is to reverse the trend of losing membership to independents, especially in counties where independents have already gained significant ground. Key to that effort will be attracting voters younger than 30, including conducting voter registration drives on college campuses, which will have the benefit of increasing a party’s racial/ethnic diversity. Advertising dollars likely will go to the largest media market (Tampa-St. Petersburg-Sarasota) as well as those markets that best fit a campaign’s target of registered voters.